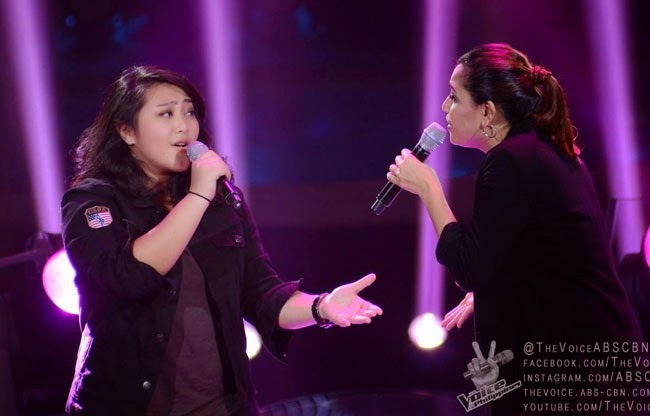 Team Sarah's Rizza Cabrera and Carol Leus will best each other in the Battles Round of The Voice of the Philippines Season 2 on Saturday, December 20, 2014. The 22 year old Rizza Cabrera was the last artist to pass through the Blinds Audition. Though she can sing and play various musical instrument, she shared that she still has stage frights. She had sang ‘Clarity’, determined to break away from shyness. Apl had mentioned that she seemed to shake during her performance while Bamboo said that she missed some notes. But the coaches are confident that Sarah will be able to help her. Carol Leus got into the Battle Rounds with the song ‘Tattooed Heart’. The 24 year old girl from Batangas has been inspired by her late sister. It was Sarah alone who turned for her. Her coach promised to develop her style more while her performance was great, Sarah said that there are more to learn. Bookmark the page and reload to see who steps up to the next round.